A single crew of reef-netters could trap several thousand salmon per day with this method, enabling the occupants of Southern Vancouver Island, the Gulf and San Juan Islands, and northern Puget Sound to share in the bounty of Fraser River bound salmon. Putting all these extra fish on the menu through technological innovation has of course captured the interest of archaeologists, who have long fuzzily recognized the importance of reef netting in this area. So for that reason alone it’s interesting to see a nice model of this technology in the above picture, thought to date to about 1928 (museum) or 1890s (whatcomwatch.org). Detail of Lummi Reef Netting Model. The on-ramp is seen above. Fish would swim along the bottom, through a path created in kelp, constrained to the sides by reefs and/or islands. 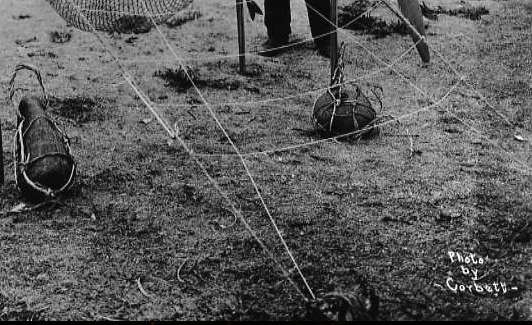 On meeting the trellis-like structure, which would be strung with sea grass to create a false bottom, the fish would be gently nudged up to the net proper. 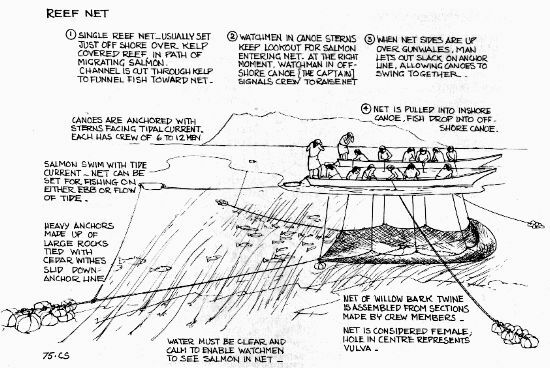 Diagram of reef netting by Hillary Stewart. The whole rig required great stability and precision of placement. It therefore meant that anchoring the canoes was essential. Indeed, the anchors are thought to be so large (probably by putting down multiple stones, one at a time, on a single anchor line) that they could not be retrieved – meaning reef-net locales should be littered with these anchor stones. Underwater archaeological investigation of the reef net sites, most notably by Norm Easton, has confirmed that hundreds or thousands of abandoned anchor stones lie on the seafloor at places like Becher Bay. Anyway, you can see the anchor stones in the picture above — note how these are unmodified boulders wrapped cleverly in organic webbing. The end result for the archaeologist centuries down the road is all too often a simple unmodified rock – as we discussed here some time ago (great comments on that post). Norm’s work is normally available here, but that site is down right now, so see the links at the bottom of this page. 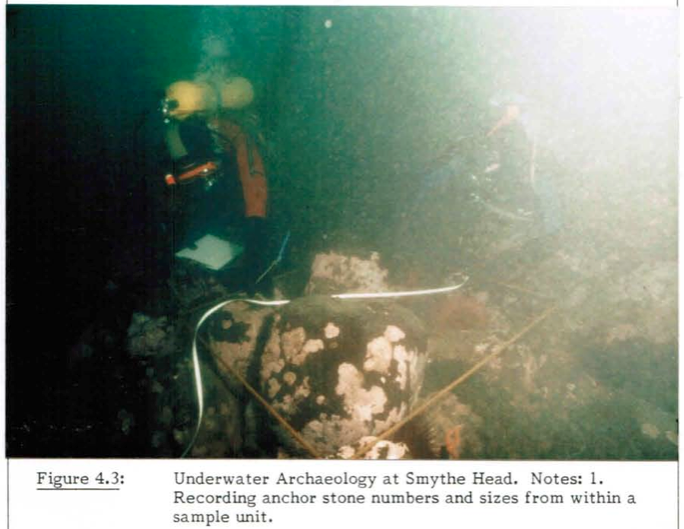 Underwater Archaeology of Straits Salish Reef Netting – anchor stones. Source: N.A. Easton MA thesis p.69. Since Norm’s work, there has also been a different approach, using sidescan sonar to map these anchor stone clusters. This work, by Charles Moore and Andrew Mason, showed it was feasible to fairly quickly and accurately account for anchor stones at reef net locations. 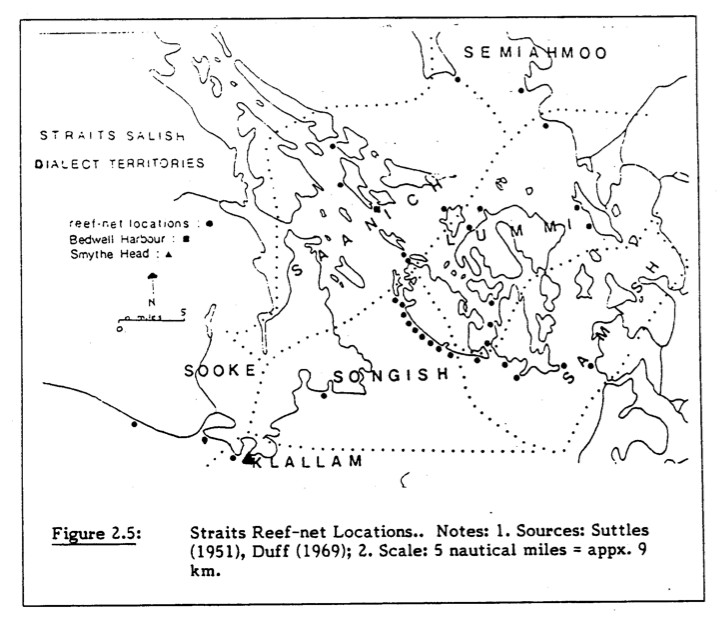 Recently I found that in a curious coincidence, around the time of Norm’s work, Daniel Boxberger at Western Washington had also initiated an underwater study of reef-netting, with the results published in the 1985 International Journal of Nautical Archaeology and Underwater Exploration – luckily a copy can be found online. Archaeological interest in this technology has yet to move seriously above the waves. 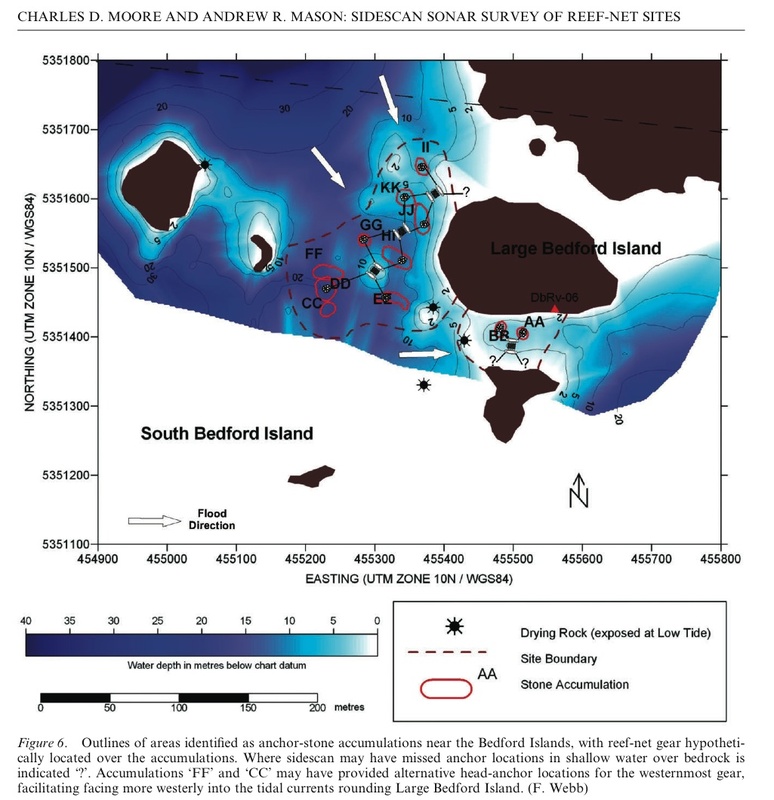 Easton proposed (1985:126+) that we look at reef-net fish camps, which should be placed precisely relative to reef-net locales, and contain a highly distinctive site structure and faunal assemblage. So far as I know, no one has taken up this idea, which would make an outstanding thesis project. In my experience, the archaeologists’ bias is that the reef-netting was aimed at sockeye salmon, in particular the major runs up the Fraser River. Interestingly though, reef netting is still practiced today as a form of cultural revitilization (video) and also as a sustainable commercial fishery (video), since the fish aren’t harmed and can be safely and selectively, released. The species being targeted by the contemporary reef nets? Not sockeye, but the salmon that gets no respect: pinks. At various sites in the NW, aDNA studies show pinks are usurping sockeye as the salmon of choice, anecdotally because they are easier to preserve. Maybe reef-netting studies need a tweak as well in the pink direction. Video of commercial reefnet fishery. Click image to watch. Anyway, this is all to say that the model in the topmost photo is a cool representation of an important technology which, when in use, has it’ most important components hidden underwater. 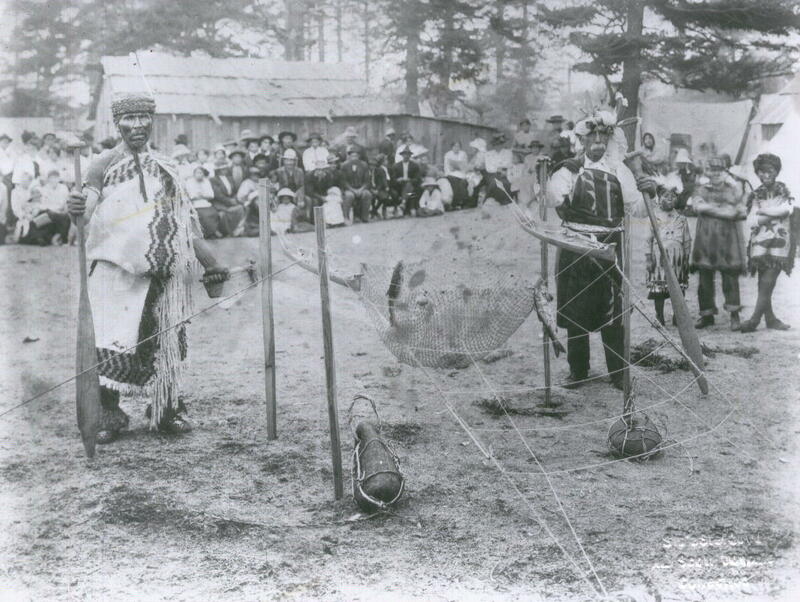 Reef nets, and other forms of “fish traps” were banned in both Washington State and British Columbia in a fairly naked way of wresting control of salmon fisheries form Indigenous peoples. 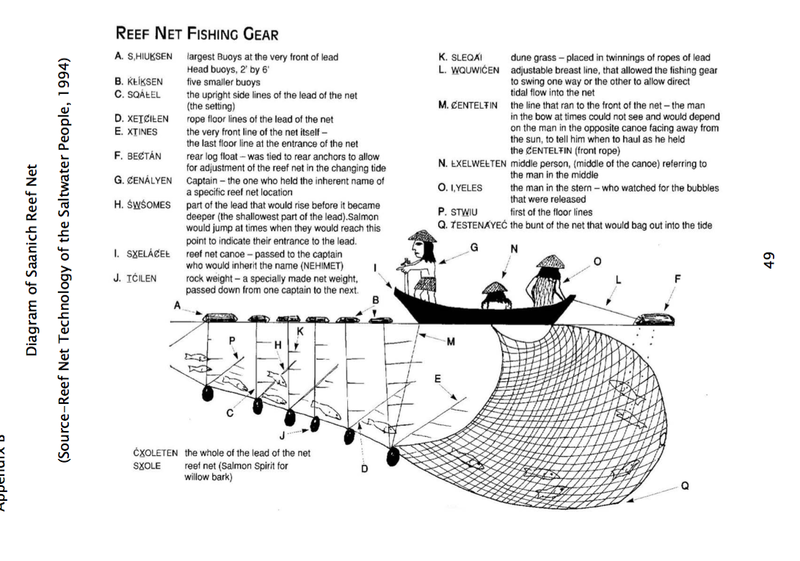 The difference between a reef net and purse seine is, well, what exactly? It would be welcome to see this sustainable fishery method spread back to its former range at the gates to the Fraser fishery. 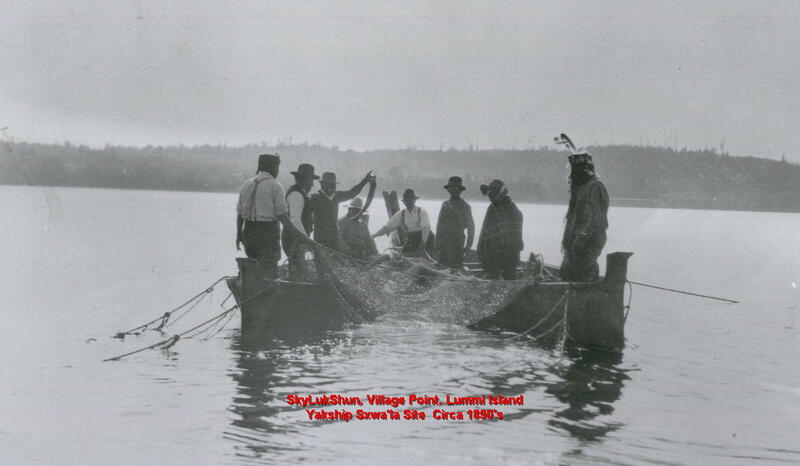 Claxton, Nick (2003) “The Douglas Treaty and WSÁNEC traditional fisheries: A model for Saanich Peoples Governance,” unpublished MA thesis, IGOV, UVIC. Moore, Charles and Andrew Mason. 2012 .Demonstration Survey of Prehistoric Reef-Net Sites with Sidescan Sonar, near Becher Bay, British Columbia, Canada. The International Journal of Nautical Archaeology 41(1):179-189. This entry was posted in anthropology, Archaeology, First Nations, history, Northwest Coast, Technology, underwater archaeology, Vancouver Island, Washington State and tagged fishing, Lummi, organic technology, reef netting, Salish, Salish Sea, salmon, Straits Salish. Bookmark the permalink. Sort of coincidentally, I just came across this other reef-net revitalization video, this one with Nick Claxton (cited above) and the W̱SÁNEĆ First Nation. Interestingly it features a model of a reef net setup much like the one I talk about above. 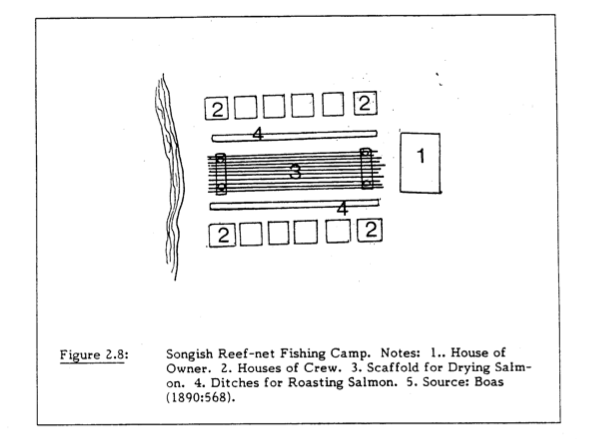 In the idealized camp drawing, the roasting ditches seem (to me) to be the feature we’d be most likely be able to identify as archaeologists to clue us in that it’s a reef fisher camp, rather than some other kind of coastal habitation. But given the limited testing we often do, this ditches would have to be pretty visible, I would think. I wonder how many of these camps have been excavated but not recognized? Prior to reading this post, I certainly wouldn’t have recognized one! 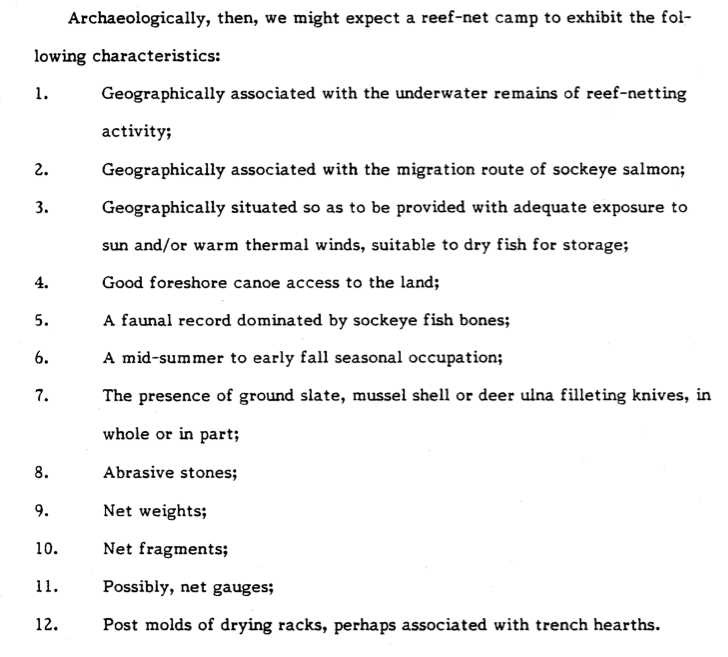 Norm Easton has a long section (6.2, page 126, see below) in his thesis which addresses his expectations of fauna, artifacts, location and features, and compares known sites in “suspicious” locations, like Helen Point to these expectations. I’d probably add Pink salmon to his list. And it’d be well worth looking at sites investigated since 1985 which might fit the bill. There’s the literature review for my hypothetical graduate student….. Otherwise, I think the key would be to go to locations like the ones along the west side of San Juan Island which don’t necessarily make a lot of sense for anything but reef netting and find sites there. Considering they may have needed to process thousands of salmon a day in the height of summer, I’d guess at least some fish camps were very close to the reef net location. 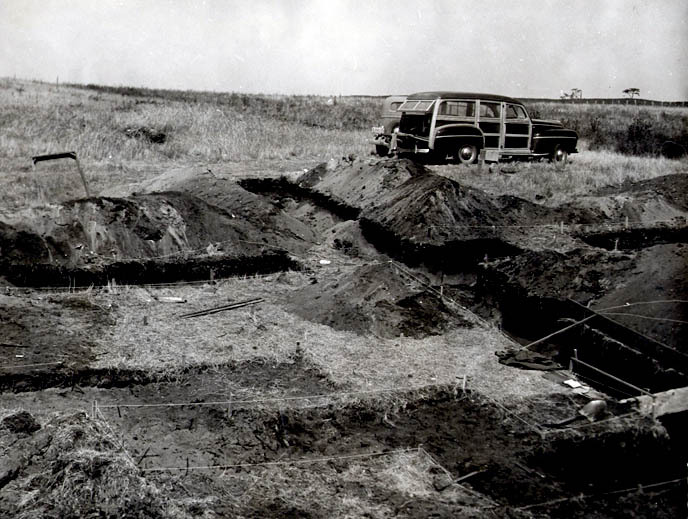 I found it on a page which also includes a nice photo of Arden King’s excavations at South Beach in 1949. This might be a site worth revisiting for the reef net camp student…. Still reading this great post. Amazing. Thanks for posting. In anticipation of my retirement from Beringia back into the Salish Sea on my 40 foot fisheries vessel I’ll be scouting new arenas for maritime archaeology over the next two summers – reviewing this post has brought to mind a combined underwater and land reefnetting site project might be something to do. It has all the elements of Beat Archaeology that I love: multi-disciplinary, strong involvement of First Nations and the Public ’cause it’s a topic they relate to, a neglected research focus, and boats on the water (and parenthetically provides verisimilitude writing about Ed Ricketts and John Steinbeck). I’ll be sailing around the end of April and middle of May (2015) in Canadian waters and looking for a few talented archaeologists, ethnologists, biologists, to join me while I do. Some of the Montague Mudsuckers and some old friends and colleagues (QM?) will join me but I could use a few more volunteers with SCUBA skills and regional knowledge to flesh out the itinerary – contact me off site at northeaston@gmail.com if this is you. . . .